As we sat in the doctor’s office, our oldest was about 3 yrs old, I will never forget it. We sat across from his desk as he told us the results of the battery of tests that I had just gone through. When he just blurted out ” Well, You should have never had your first child and you certainly won’t have any more!” Our hearts dropped as it suddenly seemed that something Jeff and I had dreamed of since I was 13 and he was 16 was now gone forever. Then imagine our surprise just about 6 years later as I looked at the positive mark on a pregnancy test. Our prayers had finally been answered. Our dream was coming true. The 3 children we dream of having as teenagers dating, was about to come true. We believe it all began when we sat in a service and as the minister got up to take the offering he said ” I have a son that isn’t living for the Lord and tonite I am gonna give the best gift I can in the offering and write on the back of the envelope, “for my sons salvation” and if you are believing God for something I want to encourage you to do the same. Jeff and I looked at each other in that service and both knew what we had to do. We placed our best gift in the offering envelope wrote “Baby” on the back and dropped it in the offering plate. Over the next month suddenly out of the blue several different times just random people would show up and hand us money. Just saying “the Lord laid this on my heart that I am supposed to give this to you.” Jeff and I could not figure out what was going on. Then it hit me, I begin counting up the random acts of kindness that had been given to us and it was exactly 10 times the amount we had given in the offering, then it hit me and I thought ” Oh No!” God isn’t gonna give us the baby we asked for, He is just giving us back our money and then some” My heart was broken, but I remember thinking ” Okay, God If it isn’t your will for us to have a baby, then I am willing to accept that you have another plan”. I am sure God must have been looking down on me saying ” Oh! Ye of little faith. “See what I didn’t realize was that this was just the beginning of God’s blessings. Because about a year later I was holding the little girl we had dreamed of having for so long, But my mind couldn’t conceive what He had in mind. Have you ever felt like that? Has God ever tried to tell you something that you just couldn’t imagine? See, I have a feeling that may have been the way Mary felt when and Angel told her she was going to conceive a baby and she had never even known a man. I think all too often we envision the people in the bible as some kind of superheroes with super powers and super strength. When they were really just human beings like you and me, with the same doubts, fears and questions and I believe we serve a God big enough that He can handle those doubts and questions. The bible says, that as soon as Mary heard the news, she “made haste” or hurried quickly to her cousin’s Elizabeth’s house. (a 10 day trip on foot) Could it have been because the Angel had said that her cousin Elizabeth was expecting too? Perhaps, Mary knew if she went to Elizabeth’s house and found out that Elizabeth really was pregnant as the Angel had said, that this all might actually be true? One commentary (Barnes Notes on the Bible) said “Troubled at his saying – Disturbed or perplexed at what he said. It was so unexpected, so sudden, so extraordinary, and was so high an honor, that she was filled with anxious thoughts, and did not know what to make of it.” I mean let’s face it if an Angel shows up at your house tomorrow and says you are gonna have the Christ Child, wouldn’t you have some questions, maybe even doubts? Then there was the birth of Jesus, in Luke 2:17-20 Mary has given birth and the Shepards show up. I don’t know about you but with each child, I have had it has seemed like a dream to me. You are just in awe and amazed that this little thing came out of 2 peoples love. I can’t imagine, what Joesph was feeling then, and what questions were running through Mary’s mind. The awe, the amazement of it all and at the same time they had to be asking themselves ” Is this really the Christ child? If it is, why is He being born in a stable? Why, didn’t God take better care of us? Did we do something wrong? But perhaps it is just about this time that all this is running through their minds when these shepherds show up! Telling everyone this is the Christ Child and in verse 19 the bible says ” She (Mary) pondered all these things in her heart” Have you ever pondered something before? Then there was the time at the temple Luke 2:20-33 Where Simeon and Anna both sensed by the power of the Holy Spirit that this was the Christ Child and the bible says, in verse 33 that Joesph and Mary were amazed at the things spoken to them. Have you ever been amazed at what God was doing and at the same time wonder why or what God was up to? Then there was that time about 2 years later. I don’t know what mom of a 2-year-old doesn’t question what is going on with their child at one point or another. But, I just wonder if on the day the 3 kings showed up, what was going on in Mary’s heart? What battle was she struggling with? Were funds a little tight and they were wondering how they were going to make it? Was Jesus being an all-out human being 2-year-old that day and Mary was questioning “Can this really be the son of God?” I don’t know what was going on in her mind that day, but I do believe God had prepared 3 kings several months, even perhaps years before to show up on her doorstep that day at that very moment, as a little reminder. God was in control. Because we know soon after that God tells Joesph to take his family and flee because Herod is about to have all the baby boys under 2 years old killed. I don’t know about you, but I have questioned God, I have miss read His plan. I have even doubted what He was doing. But just like when we placed that envelope in that offering bucket, we had no idea what God was about to do and it certainly didn’t happen the way we planned, but God was faithful through it all. He provided more than we could ever hope or imagine and I wondered today if God doesn’t want to do the same for you? No, I know He does!! He wants to do the same, Because His word says, “He is able to do exceedingly above all you can even ask or think” (Eph 3:20) I am pretty sure Mary had no idea what she was about to get into when that angel showed up, just like Jeff and I had no idea what was about to happen when we place that envelope in the offering, but what we can rest assured on is that He is in control and we may question and we may even sometimes doubt but if we will continue to trust Him. He will see us through. Won’t you trust Him today? 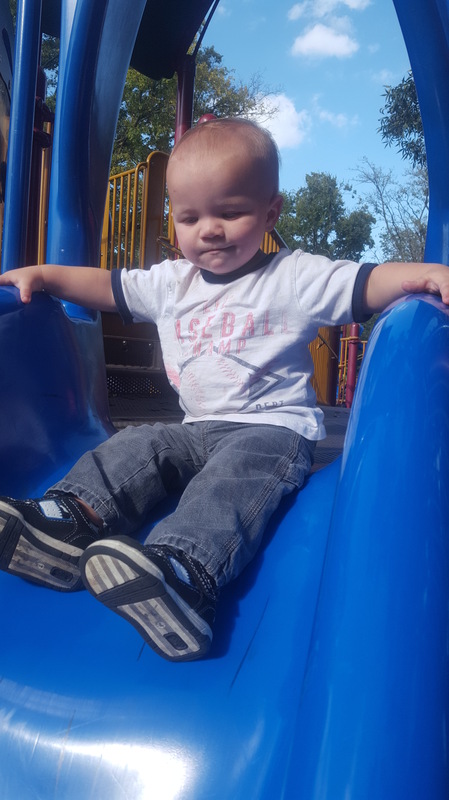 Recently I was visiting my son’s and daughter-in-law’s home and while there, I was able to take the grands (grandchildren) to the park and play. Our youngest is about 19 months old and let me tell you he is one of our greatest prize possession. Perhaps it has to do with the fact he is our only grandson or the fact that he is named after not only his father but his grandfather and his great-great-great-grandfather. We love all our grands but this one is special in his own way just as the others are. While at the park we ended up playing on one of those giant playsets. You know the kind with 3 or 4 slides, a set of monkey bars, some tunnels to play in and a bridge to walk across, this one even had ladders and a ramp to help the kids get on it. The whole thing was set in a giant pit of this soft rubber stuff, almost like ground up tires, but under it must have been sand because for this little toddler of ours who is already unsure on his feet, made it even tougher for him to walk on this mushy foundation. So, as you can imagine I was right by his side the whole time. Because of course, he didn’t want Mimi to hold him. No, this little guy thought he could do it all by himself. He wanted to walk on his own, refusing to stay in the safety of Mimi’s arms. I also didn’t want to stray too far away from him because this park was extremely busy. There must have been several hundred people there that day so I didn’t want to get too far away for fear our little guy might disappear in the crowd. He walked around on the unsteady, mushy ground, wobbling from side to side, as I followed just a step behind, there to catch him just in case he fell. Then he decided he wanted to get on this massive playset and be just like the other kids. Of course, because of the magnitude of this playset, compare to the small size of our little guy, and surrounded by this immense crowd, it was almost as if he couldn’t comprehend what the potential to play here was. So, I lifted him up to put him on the walkway, and guided him across the bridge, staying just a step ahead of him. I now on the ground and he above me, I called for him to take the next step and then another. He, slightly overwhelmed by the massiveness of his surroundings, unsure of just where to begin in this expansive play set. I put my hand between the rails that kept him from falling off the bridge just above me, patting the walkway calling, “Come on, walk toward Mimi”, Then he still unsure of his surrounding, would take a step or two, I would then move ahead again and called for him to take the next step. Time after time until he crossed the bridge and reached the other side. As I called for our little guy to take step after step, it was as if God whispered in my ear. “See this is what I do for you”. Suddenly, I saw that like this little guy, we are loved and adored by our Savior. A prized possession of the Creator of the Universe and although we are on this earth of unsure and mushy ground. We have a Protector who watches over us and is always right there in case we fall. The God of the universe who has been in our tomorrow and knows what we need before we even see it, sees the massiveness of the world around us, compared to our small size of this cosmos, He does not leave us alone, but He is our very present help in time of trouble. (Read Psalms 46) He walks beside us and leads us every step of the way if we will only follow Him when He calls. It doesn’t matter how big the problems we face ours. He is there for us always watching, always guiding us. The question is, do we listen, do we hear His voice in the immense crowds around us. Are we listening to the still small voice calling us saying “Come on, follow me”? When this world just seems like it is too much to take in when we feel like we don’t know which direction to go and what to do next. Do we rely on the one who cares for us more than any other? Do we trust that He can see what we have even yet to comprehend? I believe God wants to be our provider and protector but all too often we push Him away wanting to do it our way. We see His ways, that originated out of love and care for us, we see them as more of a hindrance, a penalty or punishment because it isn’t what we want. So instead of seeing the directions that God has provided to protect us, we resist them because we don’t like them. All the while forgetting that He knows what we don’t and we can trust Him. Thankfully, our little fellow didn’t resist me and turn and run as I called him, but he followed me when I called. I believe God is wanting us to follow Him as well. He has designed a plan called His word and He asks us to follow it because He designed it with us in mind. Everything in it He wrote to protect and provide for us. So, don’t resist it today. Trust that the creator has seen the bigger picture of your life and adores you so much He cared enough to leave this book to guide and direct you. Trust Him! Deny yourself and Follow Him! Because life isn’t a playground, you only get one chance. Do it right and follow Christ, He is waiting for you! God and the NFL – What’s really going on? My daughter is taking a world religion class and recently she called to tell me the teacher failed to use a capital “G” for God, which not only is it proper English to capitalize a proper noun, but I was raised it is also proper to capitalize any pronoun referring to our Lord and Savior. When my daughter called she commented ” It must be a Pentecostal thing” To which I replied “No, it is a generational thing” See, I feel we now live in a society that we have not only lost respect for our country but we have lost respect for God Himself and that is the real problem. We aren’t teaching our children to love God and honor Him in the proper ways anymore. Our problem isn’t what one man says or does, our problem is we have forgotten what God says and that is “To love one another, and this is how they will know you are my disciples.” But the real reason we can’t love others like God loves us is that we don’t really realize how much God loves us. Even some who have been raised in the church were raised as if God was up there in heaven with a big hammer, just waiting for us to make a mistake so He could pounce on us. So, in return, we give that same judgment to others. Then there are those who have become a consumer Christians, who claim to know God but only uses the church as a social gathering or a place to for funerals and weddings. There is no real desire to seek God and to learn more about Him, they have bought the fire insurance to keep them out of hell and that is all they are interested in. So when you are not totally in love with God, you can’t totally understand just how much God loves you and if you can’t comprehend how much God loves you then, how can you love like He loves? See because there is coming a day when the bible says, “That at the name of Jesus every knee will bow, ……..and every tongue confess that Jesus Christ is Lord. Philippians. 2:10-11 & Romans 14:11. So, let me encourage you today, No, I am really pleading with you. Let’s be the example that God has called us to be of love and forgiveness, let’s put aside our will and our ways, our causes may be good and you might have every right to be upset, but what does God say? Is really what you are protesting going to change by the action you choose or is it just causing more drama and frustration for those around you? I have often thought, if God would just wave His hand over the universe and command us all to love then there would not be these issues. But God doesn’t because He want’s us to choose, that is part of the dieing to our will and following His. He gives us a choice. The question is what will you choose today? I wonder instead of having a day where all the country boycotted or protested something, we call a day for everyone to put aside their differences and love like He has loved us what a difference that would make? So let me encourage you today if you don’t know this loving God that I have talked about. Let me introduce you to Him. His name is Jesus, He is the creator of the universe and He thinks you are His most fabulous creation He made. He loves you so much He gave His own life for you and would do again if you were the only one on earth. Let me encourage you to find a bible believing church and get involved. Begin having a quiet time with Him every day. because He is cant wait to spend time with you. He wrote you a letter called the bible He would like you to read. He loves you with an everlasting love and hopes you will have the same feelings for Him and those around you. Let’s go out this week and be that love that somebody needs. I hate reruns! And I don’t mean just a little bit. There is almost a cold chill that runs down my spine like someone scraping their nails on a chalkboard kind of feeling I get if I have to watch a T.V show or movie more than once. There is also something that just gets under my skin about watching old shows or movies, even though I have never seen them before. I guess I feel like I am missing out on something. To watch an old show, I have to purposefully put out of my mind the fact it is an older show and pretend, it is new. My husband loves old Western’s he doesn’t care if he has seen them before or not. He will watch them again and again. He also does that with old football games. He will watch a game he has already seen and knows the outcome of it. The other day we were watching a “Live” football game and some fans in the stands were holding up a banner that said, “National Champs 1996″ to which my husband turns to me and says ” They need to move on” and I replied to him “Oh! this from a man who watches T.V shows made in 1964” We both laughed but it is true. I am not really for sure why it bothers me so much. My daughter and I have had this conversation a lot recently, it’s a debate over which is best, binge-watching old seasons of TV shows on Netflix or, watching them live on the network, but having to wait from week to week to see them. I’ve noticed that a lot of the younger generations, they want to wait for the whole season of the show to be completed and a new one come out on network TV while they sit back and watch all of the old seasons a year/season behind on Netflix or Hulu. I don’t know what that says about all of us and I am sure some psychologist could tell us. But I will tell you what I think, For me, I don’t want to look back. I don’t like looking back at the past mistakes of my life, see because for too long those past mistakes held me hostage. They held me down by depression, discouragements, and anxiety. For a season of my life, they held me captive in my home as I refused to leave it or even answer the phone because I would replay the mistakes I had made over and over in my mind. My mind lived in a state of reruns of my life. That season taught me I need to keep our eyes on the prize! No runner will tell you they ever ran a race and won looking backward. A scripture that has helped me more than anything is Phil 4:8 “Finally, brethren, whatever things are true, whatever things are noble, whatever things are just, whatever things are pure, whatever things are lovely, whatever things are of good report, if there is any virtue and if there is anything praiseworthy—meditate on these things. 9 The things which you learned and received and heard and saw in me, these do, and the God of peace will be with you. All too often when we make a mistake, we focus on those mistakes or we allow what someone said to us to hurt us and we believe it as truth when it is a lie. We replay it over and over again. Or a tragedy happens in our lives and we get stuck there. At times we succumb to the lies and the fear, they begin to take over and suddenly we are allowing our feelings to control us instead of what God’s word says about us. We forget to claim the promises that He will never leave us or forsake us, we forget that His word says He is working all things together for our good. This reminds me of a person who is walking down the street in the middle of town, they suddenly fall down and trip then fall into a mud puddle. When that happens you don’t lay there and waller in it. No! you pick yourself back up as quickly as possible and you brush yourself off and keep on going, hoping no one noticed. So why when we fall, get knocked down or make a mistake do we get stuck, playing the reruns in our heads? It is the same as if we are laying there and wallering in the mud puddle. God never intended for us to let circumstances like that keep us down. That is a trick that satan uses to keep us down. Nothing makes him happier than if he can control our lives with fear, disappointments, and regrets that keep us wallering in the mud puddle. The thing is God gives us directions because He knew this was gonna happen. He tells us in Phil 4:6 Be anxious for nothing, but in everything by prayer and supplication, with thanksgiving, let your requests be made known to God; 7 and the peace of God, which surpasses all understanding, will guard your hearts and minds through Christ Jesus. Did you notice that the scripture above Phil 4:6&7 is placed in the bible right before verses 8 and 9? That is intentional you know. That’s because they go together. God calls us to not be anxious about anything. But take our needs to Him in prayer and then focus on what is good and believe what God’s word says and His peace will be with you. ALMV That stands for the Alesa Lewis Miller Version just in case you didn’t know 🙂 I say that jokingly but also seriously because you see I have walked this life and I have been the person in the puddle and I had to pull myself up out of that puddle and wipe myself off and I am telling you that if I can do it you can too! I am giving you the secret to when life knocks you down or when your world feels like it is crumbling around you. (and it will) Think on these things. It is not the time to live by feelings, your feelings will lie to you every time and lead you astray but God’s word does not lie God’s word stands. So this week, turn off the reruns! Keep your eyes on the prize (God’s Word) and dust yourself off don’t allow satan to play this game with you anymore focus on that is good and the peace of God will be with you! If you have seen our family, you know the men in my immediate family consists of 2 sons and 1 husband. You also know that 2 out of 3 of those men are not average size, in fact they range in the 6 foot 2 inches plus, tall range and lets just say in the 300 pound area, and the other is not wimpy either. So needless to say, when my 5ft 2in frame stands besides these guys they tower over me. In fact I have actually been asked, “Are these your body guards?” (because with their sun glasses on and a stern look on their face they an kind of look that way). I remember one time when there was a severe thunderstorm happening in our area, at the time we lived about 30 minutes from our church. I had went to the church for a meeting and when my oldest son (about age 16 at the time) heard how bad the weather was going to be he asked his father to get in the car and take him to the church just so he could drive me home because he didn’t want me to drive alone in that weather. Countless times my 2 big guys have been right there by my side in a crowd or whenever we are out. It isn’t uncommon for them to take my arm, and direct me in a different path because they can see over the crowd and realize there is a better direction I can go or they detour me from danger they see ahead, yet I am blind to, because I can’t see what they can see. They have a much larger perspective than I do. I can’t tell you the times I have felt comforted when walking down a long narrow scary hall or alley. Just knowing that “My body guards” were with me I didn’t worry. In fact, I walk with my head a little higher and maybe even a little strut in my step. See, I know these guys will do anything for me. I even believe they would die for me, so know, I have nothing to fear when I am with them. Because I know my guys are watching out for me. How many times do we walk in fear? We come against challenges in our lives or have to step out and do something for God and hesitate because we are scare. When our heavenly body guard is always walking with us. What could we do for God if we really believed that? If we really took God at His word and when the bill came that we couldn’t pay, or the call from the doctor came with bad news? Instead of freaking out and being upset. What if we trusted Him? I think if we really believed what He said, we would simply turn to our “body guard” or fall on our knees and rely on Him to take care of it. You may be asking what does it mean to trust God? How can I control the fear and anxiety I feel when it comes over me? You may even believe you can’t do anything different. I want to suggest to you, that next time this happens, begin to quote scriptures of the promises God has given us (you can google them or look in the back of your bible) when those negative thoughts and feeling of fear overcome you. Turn on some good praise and worship music and sometimes you just need to turn that music up loud and dance through the house and sing it like you believe it. See if satan can keep our thoughts on the negative and everything that is going wrong in our lives, he can keep us in fear and worry. My dad use to say, you can’t stop a bird from flying over your head, but you can stop him from making a nest in your hair. What that means is you can’t stop those thoughts from coming to you but you can refuse to dwell on it. So replace those thoughts of fear and insecurities with encouraging words and music from what God has promised us because, after all He is your body guard. So this week as you go about your day, and something happens that causes you to be afraid. Remember your heavenly body guard is with you. He cares about you and wants nothing but the best for you. Trust Him to walk with you in this journey because He can see what is ahead and know He has already given His life for you. Once you have done that, then walk with your head a little higher with a strut in your step! Because, God’s Got This! You know being raised in a ministers home and now being married to a minister, I have lived all over the country and each place my husband and I have lived, we have always made a point to get out and learn about the community. We always go see the sights. Sometimes we will just get in the car and drive, then stop in at the first little place we come up on and check it out, we have been known to spend the whole day just walking through a town and visiting every business. One of our favorite things to do is check out the local restaurants so we can experience the local cuisine, we may all be american’s, but there is definitely a difference in how and what we eat. From the seafood and down home cooking of the south to the fresh beef, sandwich spread and sauerkraut of the mid-west. One of our favorite things to do is go to those little, as some would say “hole in the wall” restaurants and experience the atmosphere of the community. Another fun thing that we feel helps us learn about our new community is check out the local museums and tourist locations in the area just to help us experience what others who have lived here for years or maybe even all their lives, already know. We are always excited to share what we have learned with our present congregation where we are living. Excitedly and almost proudly we share our recently new found knowledge and more often than not we are met with a “deer in headlights” kind of looks, even from prominent people in the community who should be aware of what is going on in their town and surrounding areas. It seems to us more often then not, people who have lived in the same town for a long-time tend not to really actually know about the area they live. They are content to be in their own little world, mainly their home and work, without ever experiencing all that is available to them. They are so close they don’t even see what they have at their disposal. It seems to me that most people fall into the trap of just living their life, unconcerned about everything around them and all that it has to offer, or better yet, what they could offer to it. They have what some would call tunnel vision and I am not just talking about restaurants and museums I am talking about. The needs of others, or the very need in our own soul to grown deeper in a relationship with Christ. Perhaps we were raised in church and it is “just what you do” instead of it “being who you are” perhaps people know you go to church but they don’t see the loving, forgiving spirit that God gives us everyday, in you. Often, we are so consumed with our daily to-do lists just to survive, we are forgetting what God has really called us to do. Oh! I have heard all my life, excuses like “Well, it’s just not in my nature to talk to people about God, I am not as out going as you” or “Its not my personality to raise my hands or clap in church” and you know I have really thought about this, and it was like the Lord said to me one day “They are right” “It is not their nature to do those things, because sin is the root of our nature.” It is only when we follow Christ we learn to die to our self and in the same way we turn away from sin, we also have to choose to turn and do the right thing. Even if that means we have to step outside our comfort zone. Because truth is our comfort zone is probably more on the selfish side then it is on the Godly side. See God cares enough that He not only knows all the good places to eat in town, but He also knows your favorite food. 🙂 Seriously though, He does knows every hair on your head and knew every time you would say or do something to hurt Him and yet He still gave His life for you. He wasn’t inward focused but He was outward driven, driven so much that even though He did not want to hang on a cross where nails would be hammered into his feet and hands, where He would be stripped naked and beaten for you and me, even though He didn’t “feel” like going through all that, He did it anyway for you and me. (see Matt 26:39 & Luke 22:42 ) He loved us enough! He cared for us enough! That He left the comforts and home of heaven above and gave His life for you and me. So don’t you think you and I can step out of our comfort zone, can’t we look beyond ourselves, get involved in our community, reach out to our neighbors that live around us and most importantly, give Him ALL the praise and glory He deserves?Let’s not be so close, that we can’t see what is right in front of us.